The City of Light is rich with haute hotels. The grandest of dames line the posh streets of Paris' 1st and 8th arrondissements, where affordable room rates are as rare as the 130 euro entrecôte steak served at dinner. This summer, travelers with Veuve Clicquot tastes but PBR budgets can still sample the high life at three of the city's ritziest digs. Luxury icons Le Bristol, Mandarin Oriental, and Raffles have debuted swank summer gardens currently open to the public. From Michelin-starred snacks to Dom Pérignon by the glass, these new spots provide the perfect taste of luxe Parisian hospitality – for considerably less than your average overnight. A luxury landmark since the early 1800s, Hotel Le Bristol has hosted generations of boldfaced names in a prime location near the Élysée Palace. 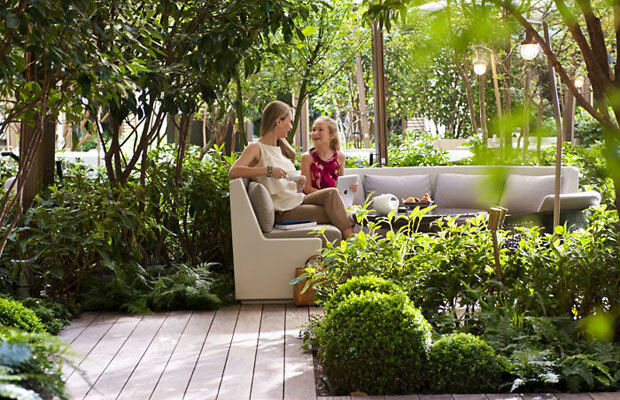 Channel your inner Grace Kelly at its recently renovated, 13,000-square-foot garden "à la française," connected to the three-Michelin-star restaurant, Epicure. Old-school glamour of this caliber doesn't come cheap – think appetizers starting at 42 euros. 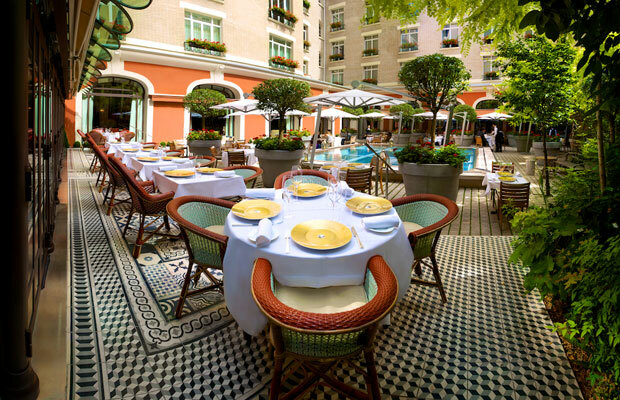 But, a great compromise is Epicure's substantial, 30 euro (about $40) cheese plate, served on the garden's elegant terrace made of rare, white Botticino marble. La vie est belle, n'est-ce pas? In the courtyard garden of the 1st arrondissement's très modern Mandarin, well-heeled locals join an international crowd for elegant bistro classics and Asian-influenced small plates by Michelin-starred chef Thierry Marx. Menu items like daikon-wrapped crab, and asparagus topped with caviar and quail egg, are complemented by an impressive list of rosé wines and summer cocktails created specifically for the garden. One of the best luxury deals in town is Marx' two-course lunch menu, served in the courtyard for 55 euros (around $73). The Philippe Starck-designed Raffles brings artistic flair to the prim and proper 8th arrondissement. In addition to its on-site gallery and well-connected art concierge, the hotel has a seasonal terraced garden surrounding an oversize sculpture of a teapot by Portuguese artist Joana Vasconcelos. Art world insiders nibble seasonal French fare and Pierre Hermé pastries in the leafy space, which surrounds an elegant "pond" overlooking the glass-ceiling-covered swimming pool of the Clarins spa below. The garden is open to the public throughout the summer months, so order a flute of Dom Pérignon, available by the glass, and enjoy a taste of the avant-garde. Have you experienced these Parisian gardens? Tell us what you thought!